Who is Floyd Mayweather Jr.? Professional boxing promoter and former professional boxer who has 15 world titles in his name, making him one of the greatest boxers, pound for pound, of all time. He is best known for his blazing speed, powerful punches, and flawless performance inside the ring. He retired in 2017 with an undefeated record of 50–0. He is regarded as the best defensive boxer in history who has a record of 26 consecutive wins in world title fights, 23 wins in lineal title fights, 24 wins against former or current world titlists, 12 wins against former or current lineal champions, and 2 win against International Boxing Hall of Fame inductees. Floyd Mayweather Jr. was born on the 24th of February 1977, in Grand Rapids, Michigan, United States of America. He’s currently 42 years old. Place of Birth Grand Rapids, Michigan, U.S.
Mayweather attended Ottawa Hills High School in Michigan but he dropped out. Mayweather has been dating British shop worker and aspiring singer, Brit Raemarni since 2016. He had a fair share of women in his life but he has been married to none. To start with, he briefly dated model Erica Dixon before he got engaged with actress Josie Harries. The couple was together for about 14 years but unfortunately, their relationship ended in a bitter note. They have three children from this relationship – son Koraun Mayweather (born 19th November 1999), daughter Jirah Mayweather (28th March 2001) and son Zion Shamaree Mayweather (20th June 2003). Floyd then involved in a relationship with Melissa Brim for two years from July 1998 to August 2000. Then, he dated American Model, Shantel Jackson for 8 years. The couple got engaged in September 2010 but later separated in April 2014. In 2008, he had a fling with American Singer, Rozonda ‘Chilli’ Thomas. After that, he was romantically linked with American Singer Keyshia Cole for seven months from 25th February to September 2008. Floyd also dated American Reality TV Contestant, Princess Love for two years from 2012 to May 2014. He then briefly dated model Doralie Medina from 2014 until 2015. In 1993, Mayweather won the National Golden Gloves championships with an amateur record of 84–8. Floyd Mayweather won his first professional bout on October 11, 1996, when he knocked out fellow newcomer Roberto Apodaca in Round 2. He has major world titles under his belt including the WBC super featherweight champion, WBC lightweight champion, WBC super lightweight champion, IBF welterweight champion, WBC welterweight champion, WBC light middleweight champion, WBA (Super) light middleweight champion, WBA (Super) welterweight champion and WBO welterweight champion. Floyd did minor roles in films as well as served as the executive producer of 30 Days in May, a TV documentary movie, released in 2013. In 1997, he made his first appearance on a TV series Arli$$. Floyd Mayweather has endorsed several brands like Nike, Reebok, etc. He also appeared in a TV commercial for AT&T in 2009. He has an estimated net worth of $565 million US dollars. He was one of the highest paid American athletes during his time. He has often listed on the 50 highest paid athletes list by Forbes and Sports Illustrated. On August 26, 2017, Floyd Mayweather fought Conor McGregor, which was his last fight and the highest grossing Pay Per View boxing event in history, and reportedly earned over $300 million from the fight. As a resident of Nevada, he didn’t pay any state income taxes but will pay around 40% of his earnings to the IRS. He owns several properties and resides in a 22,000-square-foot (2,000 m2), five-bedroom, seven-bath, a custom-built mansion in Las Vegas, Nevada. He also owns a $1.5 million house in Sunny Isles Beach and a $2.5 million condo at the Ritz Carlton Residences in LA. He recently bought a $7.7 million five-bedroom Miami Mansion that apparently has a floating staircase. It is reported that Mayweather owns over 100 cars which include Bentley Mulsanne, Ferrari 458 Italia, Ferrari Enzo, McLaren 650s and other significant models of luxury car brands. During his career, Mayweather has won several prestigious awards and honors including Michigan State and National State Golden Glove Champion Award, both of which he won three times. In 1998 and 2007, he won International Boxing Fighter of the Year Award and The Ring Fighter of the Year Award. He won the BWAA Fighter of the Year award thrice. He even won the Boxing Hall of Fame and ESPN Fighter of the Year award. He is a six-time winner of Best Fighter ESPY Award. 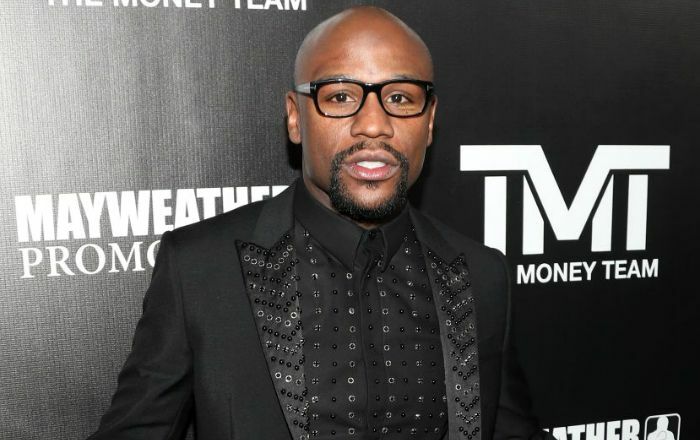 Floyd was included in Forbes and Sports Illustrated lists of the 50 highest-paid athletes in 2012 and 2013. He was also included in Forbes list again in both 2014 and 2015, in the highest paid athlete in the world lists. Mayweather has been honored with Boxing Writers Association of America Fighter of the Year in 2007, 2013 and 2015. In 2015, Spike TV has awarded Mayweather with The Best Ever award. In 2016, Mayweather clutched three Guinness World Records: for most bouts undefeated by a world champion boxer in a career, highest career pay-per-view sales for a boxer and for most expensive boxing championship belt of $1 million. In 2008, Mayweather recorded a rap song titled “Yep” that he used for his entrance on WrestleMania XXIV in his match against Big Show. Mayweather owns a boxing gym called the “Mayweather Boxing Club” located in the Chinatown Plaza in Las Vegas. In 2017, he appeared on the fifth season of Dancing with the Stars with his partner Ukrainian-American professional ballroom dancer Karina Smirnoff. They were the fourth couple to be eliminated from the competition, finishing in ninth place.